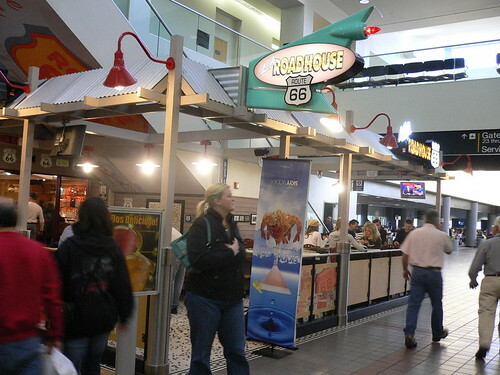 For those of you who have the chance to be in Los Angeles, allow me to recommend "The LA Roadhouse - Route 66" at the Northwest Airlines terminal. It is located next to Burger King. Their Crabmeat Quesadillas is damn good. Whenever I am there during lunch time, you'd be sure to find me seated at the bar counter eating that and washing it down with a Jack 'n' Coke. Having been to LAX for countless of times over the last 5 years, I more or less recognise the people working there and especially the bartender who served me the food and drinks. Well, this time round, I was there much earlier for a morning departure and so instead of going there, I settled for a simple breakfast at the Burger King next door. As I was eating, I saw the bartender from next door LA Roadhouse coming out from the staff entrance of Burger King (blue door on the left). I think their kitchen are interconnected in order for him to come through the blue door. 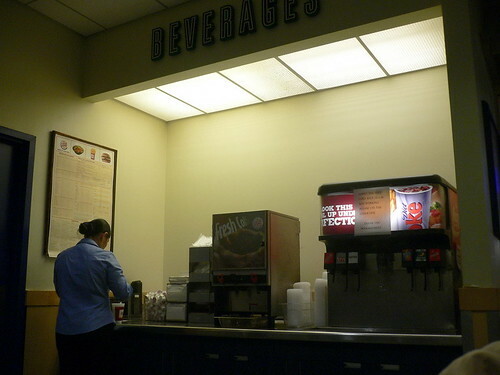 Anyway, there he was holding an empty coffee pot in his hand and proceeded to the self-service beverage station and filling his pot with Burger King coffee! OMG!! The people over at the other side paying 3 times the money for Burger King coffee!! What a rip-off!! Fortunately for me, as I have told MeePok , I have a no-coffee policy when I am in the US. Heng ah.... I'll stick to my Jack 'n' Coke. Spinnee: Route 66 was actually an inter-state highway that linked Illinois to California in the old days since 1926. It was decommissioned in 1985.
erm, the statement was actually mentioned during the movie.. hah!! Gary: Yes, indeed it is the very same highway featured in the movie Cars. and burger king allowed him to do that??!! Wah!!! Morale of the story, dun lim kopi in US... :P hehehe!